At least six Indian sailors were killed and an equal number of them went missing after two fuel ships carrying Indian and Turkish crew members caught fire in the Kerch Strait, where the blaze was still raging following the accident on Monday, officials said on Wednesday. Russian authorities on Wednesday resumed search operation for 10 missing sailors, including four Indians, in the Kerch Strait which separates Russia from Crimea. One of the ships, the Candy, had a 17-member crew, including nine Turkish citizens and eight Indian nationals. The other one, the Maestro, had 15-member crew, including seven Turkish nationals, seven Indians and an intern from Libya. "We regret to inform that there have been causalities among Indian seamen working on these ships," the Ministry of External Affairs said in a statement in New Delhi. The deceased were identified as - Pinal Kumar Bharatbhai Tandel, Vikram Singh, Sarvanan Nagarajan, Vishal Dod, Raja Debnarayan Panigrahi and Karankumar Haribhai Tandel. Six missing Indian sailors include Siddharth Meher, Neeraj Singh, Sebastian Britto Breezlin Sahayaraj, Rushikesh Raju Sakpal, Akshay Baban Jadhav and Anandasekar Avinash. "Russian Maritime Agency and Maritime Rescue and Coordination Centre Novorossiysk are continuing efforts to locate those listed as missing," the MEA said. It said that arrangements are being made after completion of necessary formalities to bring back the bodies of the deceased to India. The repatriation of the other sailors is also being facilitated through Director General Communication Center, Indian Registry of Shipping, Mumbai. Four Indian sailors - Harish Jogi, Sachin Singh, Ashish Ashok Nair and Kamleshbhai Gopalbhai Tandel - were rescued by the authorities. "The two ships are still burning, the Spasatel Demidov vessel approaches them from time to time in order to throw water on them, but it cannot stay close to the fire all the time," a Russian Federal Agency of Maritime and River Transportation official was quoted as saying by the TASS news agency. Turkey has said four of its nationals were killed, eight were rescued and four went missing after the fire. Indian authorities said the Indian embassy in Moscow was in constant touch with the concerned Russian agencies to get more information on Indian nationals. Both vessels were flying Tanzanian flags. One of them was a liquefied natural gas carrier and another one was a tanker. The fire broke out as the two ships were transferring fuel from one to the other. Turkey's Milenyum Denizcilik Gemi company is believed to own both ships. A local official of the maritime rescue service said that the Merkury tow boat, which brought the sailors to Crimea's Kerch on Tuesday, was also returning to the accident scene. "Merkury is heading to the fire scene, it will be involved in searching [for the sailors] and extinguishing the fire," a spokesperson said. A special vessel, Spasatel Demidov, is continuing the effort to put out the fire, which is still underway. The ships have not sunk because their important parts remain intact. 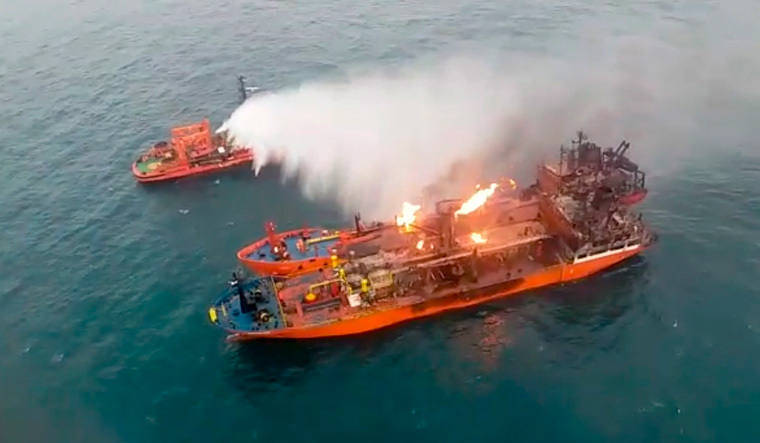 Citing a source in the Azov-Black Sea branch of the Maritime Rescue Service, the TASS said that attempts to extinguish the fire were failing because of burning LNG. "Only LNG is burning at the moment. The fire engulfing parts of the ships has been extinguished but gas is coming out and burning, it is like a gas burner," the source said, adding that according to recent information, the Candy was carrying about 2,500 tonnes of LNG. There is no information about the amount of gas carried by the Maestro but the two ships are similar in size, so it might be the same. The condition of sailors who were rescued during the ship fire incident in the Kerch Strait causes no concern, head of Crimea's Disaster Medicine and Ambulance Center Sergei Olefirenko was quoted as saying by the TASS. "The rescued sailors are being treated at Kerch City Hospital. Their condition is fair, there are no signs of deterioration. There is no danger to their lives," he said. Meanwhile, Crimean Human Rights Ombudsperson Lyudmila Lubina said that border guards and consular workers were preparing documents for the rescued sailors. "They are Turkish and Indian nationals. Border guards and consular services are working on documents so that they can return to their home countries," the ombudsperson added.